The “DFB-Junior-Coach” project brings football directly to the schools, training young coaches, which ultimately leads to an improved situation within football clubs and associations, where there is currently frequently a shortage of voluntary junior trainers. 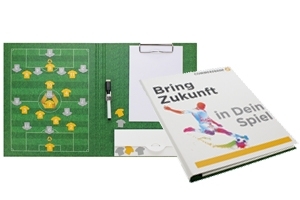 As the exclusive national project partner, Commerzbank is supporting the initiative and provided the aspiring football trainers with a folder that aims to help them explain tactical moves. The cross between a folder and a clipboard developed by K+M stands out because of its individual, CI-compatible design and convinces as a well-thought out combination between a promotional product and working tool. The specially produced magnets are used to graphically explain tactical moves to young players. The trainer folder that picked up a Promotional Gift Award 2018 in the category Custom-made Designs was individually developed to meet the requirements of the customer and can be correspondingly adapted to suit other companies.